﻿ Magician's Academy RPG - J-RPG Blog! Magician's Academy is a series of light novels by Ichiro Sakaki. It's about a school where people go to learn magic, but it has a wacky moe-infused sensibility. To give you an idea, one of the teachers built a machine called "Mimigar Z", which caused most of the school to sprout animal ears. There's also an anime adaptation called "Macademi Wasshoi! ", which is how I originally discovered it. It's kind of a gratuitous, guilty pleasure, doubly so since the character designs (and the art for the light novels) were by BLADE. 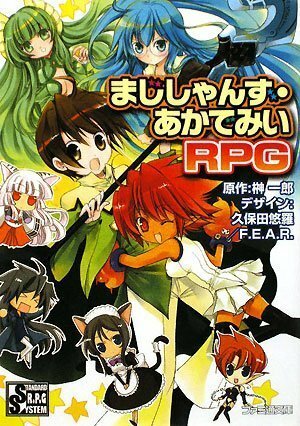 Magician's Academy RPG (or "MAR") is an RPG from F.E.A.R. that adapts the light novel series using a tweaked version of their SRS house system. It's the third game they've done that's a light novel adaptation (the others are Kaze no Stigma and Shinkyoki Soukai Polyphonica). It's one of those bunk (little paperback) format RPGs, a little over 400 pages, and I was able to order it through the local Kinokuniya for about $12 (where the Japanese price is 800 yen). For this post I'm going to run through the stuff that makes it different from other SRS games I've read. MAR uses SRS' typical character creation scheme, where you pick out a total of 3 levels from 1 to 3 different classes, which in turn determines your attributes and what special skills you can pick from. What makes it different from other SRS games is that characters are a combination of a "Macademi Class" and a "Style Class". Style classes relate to the character's role in the story, things like Servant, Joker, Misfortune, and Artificial. Where Macademi Classes give a character skills representing special powers, the skills you get from a style class tend to be more meta-game. For example, SRS features "Appearance Checks" (登場判定), where the GM can have a player roll to see if his or her character gets to show up in a given scene. A Servant character can take the Allegiance skill to get a bonus to Appearance Checks if their master is also in the scene. On the other hand the "Misfortune" Style Class gives you lots of skills that let you take damage and such in place of other characters. This is one of the most distinctive aspects of the game, though one I have mixed feelings about owing to how it's implemented. It's like they stumbled on something kind of like the aspects from FATE, but IMHO the implementation relies a little too much on GM fiat. Each class gives a list of personality trait ratings, and you pick one of your character's classes as the base. From there, stuff in the game's lifepaths and such and modify these numbers, usually by shifting a point from one side of a pairing to the other. For example, the "Everyday" table has a "Research" entry, which gives you -1 to Brave and +1 to Careful. There are also items that can affect personality traits, such as Bunny Ears (which are in the "Moe Item Table"), which give you +1 to Trustful. In play, the GM can call for a player to make a Personality Check (2d6 plus a personality trait, against a difficulty of 12) to see if the character will in fact do something. So, if the characters are late for class and they come across a girl who needs help, the GM might call on a Compassionate check to see if the character actually lends a hand. Any time a personality check makes a character veer away from what the player wanted, the character gets an Impulse Point (衝動店), which the player can use for a host of fairly typical metagame effects. There's also a special rule that once per session you can substitute Passionate in place of whatever personality trait the GM is asking for. To be honest I'm not sure what to make of it. It's the kind of setting where throwing in random stuff certainly makes sense, and I suppose that having the option to just say, "Oh, Tanarot took care of that. Now, about your characters going on a date?" fits as well. I like the idea of bringing the canon characters into the game--the setting is neat, but Tanarot and company are a big part of what gives the story its distinct feel--but needless to say I have mixed feelings about chucking them in as deus ex machina to fix things. Whatever one thinks of the house system approach of SRS, MAR does actually take advantage of its strengths. In particular, at the end of the book there's a section on taking stuff from other SRS games (Alshard Gaia, Polyphonica, etc. ), which would give GMs plenty of critters and characters to mess with. There is a "World Section" that explains the setting, but it's barely 12 pages. Especially given that it's actually put out by the same publisher (Famitsu Bunko, though it at F.E.A.R. are both parts of Enterbrain), this suggests that they're assuming people who buy the RPG will also be into the light novels. I ordered the first novel in the series along with the RPG, and the two certainly look like they belong together. The book has brief bios of the major canon characters (and Hapciel). On the whole, this looks like a neat little game, though you clearly have to be on board with the game having a very strong GM role to really enjoy it as written. If there was an English version of this, I'd most likely be willing to give it a spin, but on the whole I think I'd rather do a crazy Maid RPG variant. Not unlike Penguin Musume Heart, while watching Macademi Wasshoi I kept feeling like I was watching something that runs on Maid RPG's physics engine. This sounds really interesting, especially personality-as-character class thing (I've seen it in another recent game, I can't remember which now, but I really like that idea). I'm also wondering if the personality traits aren't an influence borrowed from the Persona 3/4 console games.